Making laws which apply to half a billion people and need buy-in from 28 countries, plus a European Parliament, means a complex framework so whilst EU rule-making is second nature to those involved in the process such as lawyers and policy wonks, for everyone else it's a bit of a labyrinth. I know: I’ve been in it and explained it to 'lay' audiences - eyes widen, jaws sag, four letter versions of “seriously?” are muttered. On the plus side, all EU legislation is made this way (for the moment) so once you know the process it stands you in good stead. This article whips through what the European Commission, Parliament and Council are and how EU law is made. The European Council sets the EU’s overall political direction and priorities on the really big issues and is ultimately in charge of things like the EU’s foreign policy. It’s made up of the heads of state or government of the 28 (27 once the UK leaves – I’ll just say this once as it’s quickly going to get tedious) EU member states i.e. Prime Ministers, Presidents, Chancellors and Taoisearches (title for Ireland’s Head of State in case anyone was wondering). It’s worth noting “The Council of the EU” is not the same as the European Council mentioned above. The Council of the EU is where national ministers from each EU country meet to adopt laws and coordinate policies. For example, Germany’s Health Minister, rather than Chancellor Merkel, will sit on this Council when it discusses issues related to health. When the Council of the EU makes decisions, it typically uses a voting system where the number of votes a country has depends on the size of its population so that more populous countries carry a little more weight. For “sensitive” matters, such as rule harmonisation on indirect taxation and EU finances, all 28 countries must vote ‘yes’ to pass the law. Every six months one country takes its turn to become the Presidency of the Council – which means it to organises all the work, sets the agenda and chairs the meetings. Currently, Austria is in the hot seat until end of 2018.
it also make proposals for new law where it thinks this is needed (see below for summary of the way the EU makes laws). The Commission’s political leadership comprises the “College of Commissioners”, 28 members – one from each EU country including the President (Jean-Claude Juncker) and the Vice-Presidents. Each Commissioner is given responsibility for specific areas and each country nominates a Commissioner to serve a 5-year term, lobbying hard for their Commissioner to head up the department covering the interests nearest and dearest to their hearts. The European Commission is divided into different departments known as “Directorate-Generals – DGs”. Note on Brexit: Pre the Brexit referendum in 2016, the UK held the Commission for Financial Services but this quickly changed post referendum and now the UK’s Commissioner (Julian King) is responsible for Union Security. The European Parliament (EP) is the only EU institution directly elected by EU citizens. The EP was originally made up of representatives from the national parliaments in EU countries but since 1979, Members of the EP (known as MEPs for short) have been directly elected by EU citizens. Their job is to bring transparency and accountability to the EU on behalf of ordinary people. Together with the European Council, the EP passes EU laws and agrees the EU budget. It also supervises the European Commission’s and other EU institutions’ (e.g. ESMA’s) work. There can be up to a maximum of 751 MEPs. The number of MEPs allowed per country is based on the size of the country’s population. Most MEPs belong to a political group, which brings together more or less like-minded political parties from different countries, though a few stay outside this system. Germany, followed by France, have the most MEPs as they have the largest populations. The last EP election was held in 2014 and the next election is in 2019. The Treaty is the foundation, a document signed up to by all the 28 EU Member States which sets out what the EU is for, what it can do, and how it should do it. So, for example, it sets out what areas of policy the EU is responsible for, which EU bodies there are and what they can do, how new EU laws are to be made, the conditions for new countries to join, and how the EU will be paid for. There have been lots of treaties over the years – usually named after the places where they were signed – but they’ve now all been rolled into one with the location of the latest one being Lisbon, hence ‘the Lisbon Treaty’. At the end of every 6-month Presidency the heads of government get together and as well as making decisions on things happening right now, they generally make some pronouncements about what direction things should take in the months or years ahead. The Commission will look at these pronouncements and consider whether to make a proposal for new legislation. Sometimes the ideas for the proposals come from national governments, industry or other people affected for example, people who want to be able to do something in the EU and can’t (like sell their products easily in another country) or where decisions taken by one country have implications for everyone (like environmental safety). The Commission will generally spend a lot of time talking to people before putting together a proposal for legislation and consulting formally on it. When it makes the proposal it has to explain why it thinks the legislation is necessary, what part of the Treaty allows the EU to legislate in that area, and what effect it thinks the law will have. In most cases, the draft law is then considered by the European Parliament on the one hand, and the Council on the other. Each of them forms their own view on what’s good – or not so good – and what they think needs to change. Once each has their own view and version (meaning at times there are three different versions of the same draft law floating around – the Commission’s, the Parliament’s and the Council’s – and each regularly updates its version, hence why my inbox kept crashing in MiFID II days as multiple versions kept coming into my inbox), they start negotiating with each other to try to agree a common way forward. 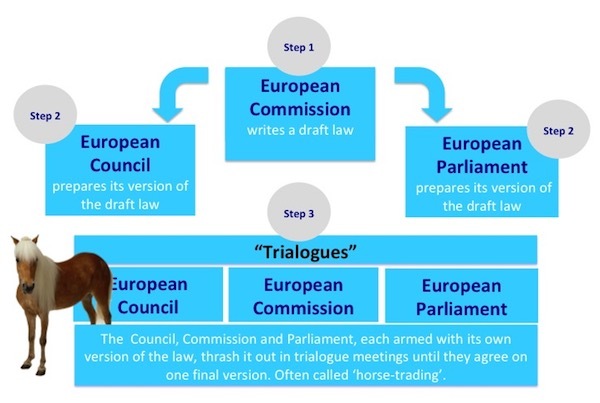 This negotiating process is known as the trialogues, or more colloquially, ‘horse-trading’ as they reach a compromise on one final law. The above process I’ve outlined takes us to the point of having a final ‘Level 1’ text but anyone in financial services who’s dealt with EU regulation knows it’s only just begun: there are the more detailed level 2 rules, guidelines and Q&As to be drafted, debated and implemented. Read my article “Looking for the MiFID II Rules? 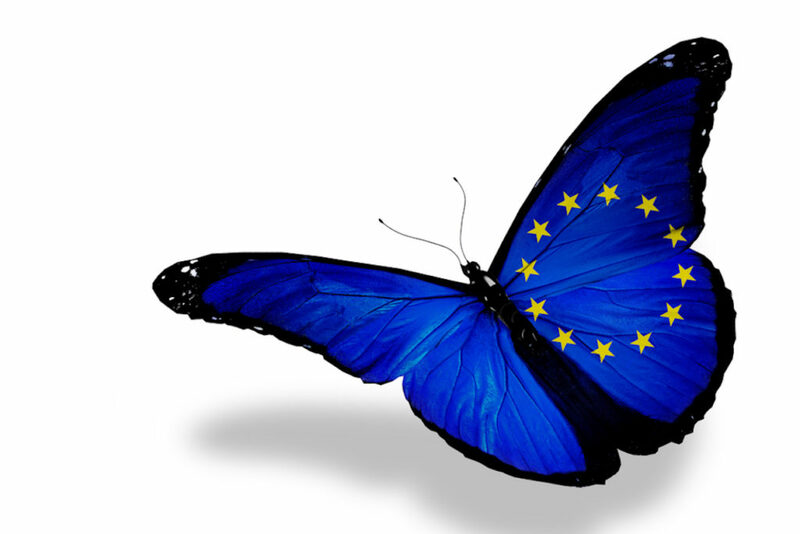 This will save you time!” to find out more about how the EU rule process works.